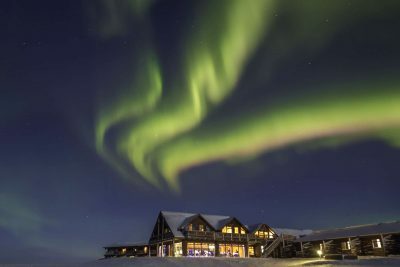 Celebrate New Year in style on this fantastic short break combining fireworks and a festive gala with aurora hunting and natural wonders galore in Iceland’s beautiful southwest. 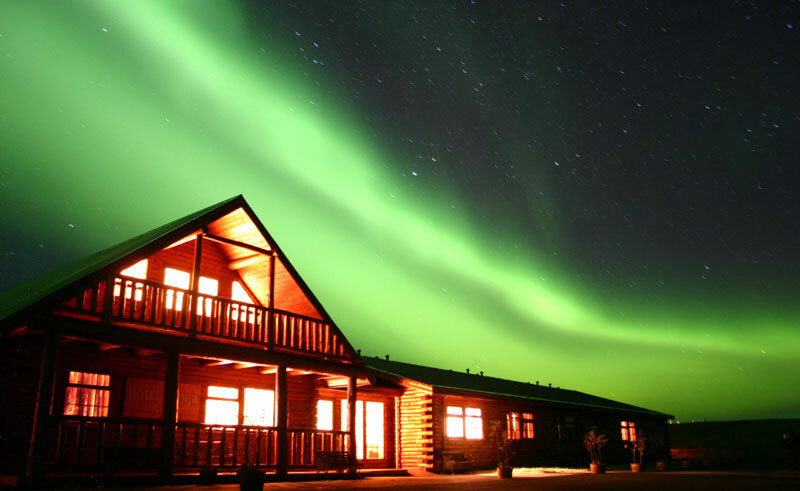 This escorted holiday is based at Hotel Ranga ideally located for northern lights watching, as well as expert-led tours of the South Coast and Golden Circle. 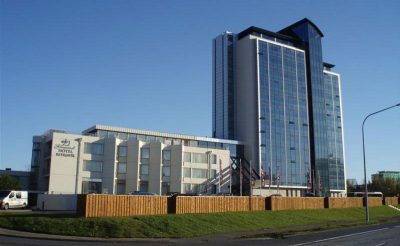 Although sightings of the aurora can never be guaranteed, this holiday includes two nights in a countryside hotel, far from artificial light pollution. Hotel Ranga boasts aurora wake-up service, outdoor hot tubs and stargazing observatory. 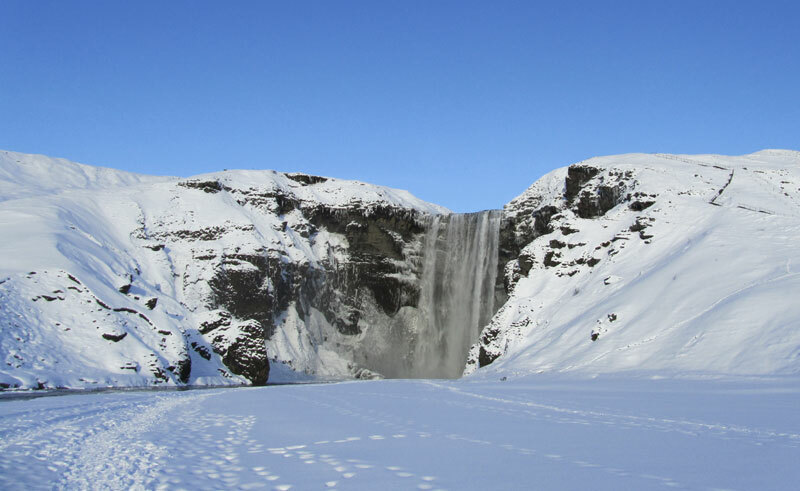 Aurora hunting by night, waterfall chasing by day... the guided tours on this escorted holiday will take you to some of Iceland’s most beautiful cascades. Seljalandsfoss and Skogafoss are stars of the South Coast where you will also skirt the volcano of Eyjafjallajokull and visit Vik with its black-sand beaches and dramatic sea stacks. Exploring the Golden Circle, you will feel the thunder of Gullfoss waterfall, as well as witness the explosive power of the Strokkur geyser and walk through a rift between the North American and Eurasian continental plates. After all that fresh air, you’ll spend your evenings indulging in fine dining and relaxing in your hotel’s outdoor hot tubs. Peruse the shops, cafes, art galleries and museums of stylish Reykjavik as you build up to the New Year celebrations. 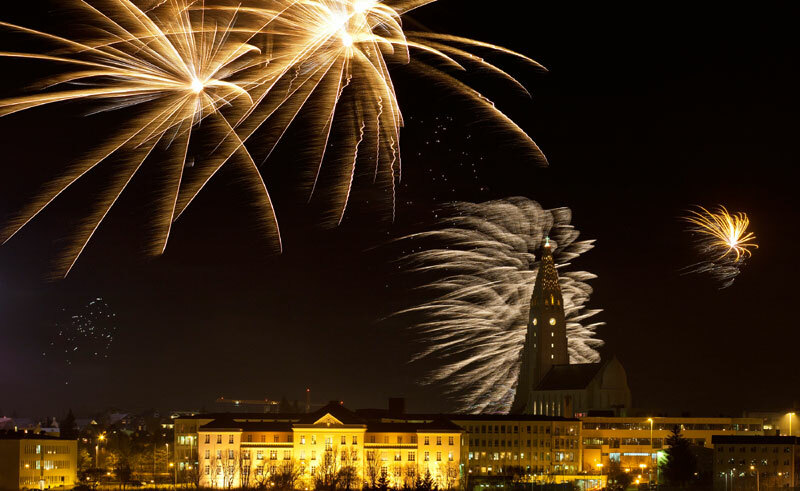 On New Year's Eve, enjoy a festive gala witha 4 course dinner at Grand Hotel Reykjavik and enjoy the city’s magnificent fireworks display. 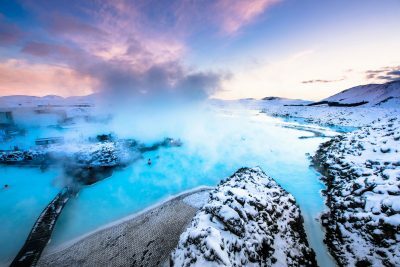 On New Year’s Day, explore more of the sights of Reykjavik or treat yourself to a relaxing dip in the soothing, silica-rich waters of the Blue Lagoon – an unforgettable way to welcome the New Year! Please note: entrance to the Blue Lagoon is at an additional cost and pre-booking is essential. Meet your guide and the rest of the group in arrivals at Keflavik Airport, then transfer to Hotel Ranga for a two-night stay on a half board basis (breakfast and a 3 course set menu dinner - chef's choice). Arrangements are usually made for participants to dine as a group. Enjoy scenic touring of Iceland's south coast; including the stunning waterfalls of Seljalandsfoss and Skogafoss. 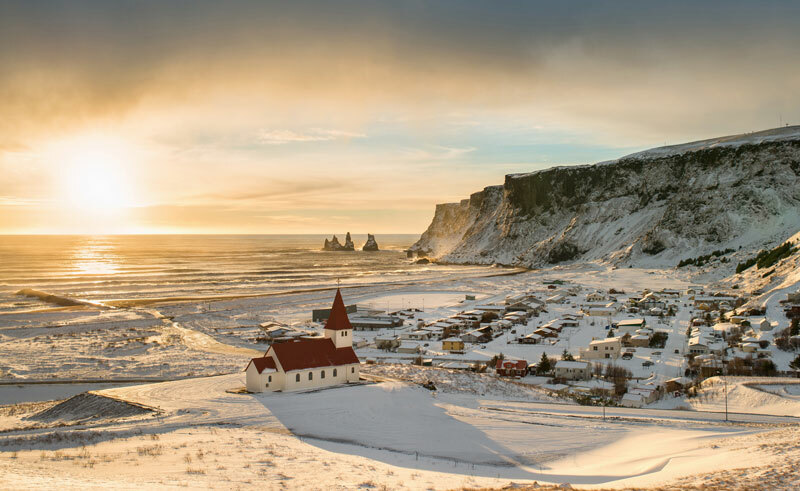 Reach the small town of Vik, with its photogenic sea stack rock formations and the intriguing beach-edge basalt columns. Spend the day exploring the famed Golden Circle route including Thingvellir National Park, where you can walk the rift in between the Eurasian and North American tectonic plates, the spectacular two-tiered waterfall of Gullfoss and the spouting geysers of Geysir geothermal area. Arrive in Reykjavik and say your goodbyes to your guide in the afternoon. Then its time to dress up before starting the evening of festivities at Grand Hotel Reykjavik with a welcome drink, before your delicious 4 course dinner. After dinner set out by coach to Kopavogur and witness one of the largest bonfires in Iceland. Then it’s back to the hotel for dessert and just before midnight with a glass of bubbly in hand, watch as Reykjavik's skyline lights up as we welcome the New Year! There are no restrictions on the use of fireworks in Iceland, and this annual tradition means that displays are truly spectacular as locals welcome 2020 in style! 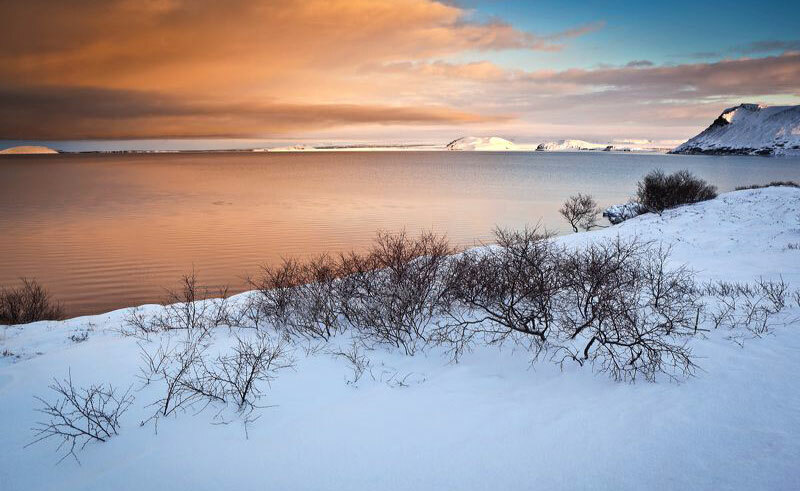 Enjoy a day exploring Reykjavik independently or alternatively, you may wish to book an additional excursion or head to the world famous Blue Lagoon (entrance at additional cost – pre-booking is essential) for a relaxing bathe in the silica-rich waters, the best way to start the New Year! Please contact us in advance to arrange this. Transfer to Keflavik Airport for the flight back to home.